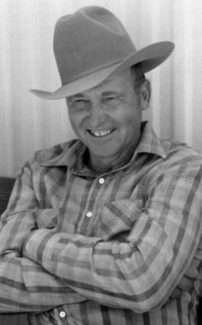 Bernard Walton Strait was born in Bonesteel, South Dakota, on February 4, 1926, to Cecile Waggoner Strait and John Walt Strait. At the age of three the family moved to Mellette County where his family farmed and ranched. He attended Prosperity Flat School through the eighth grade, and then attended Murdo High School where he graduated in 1944. On October 5, 1947, he was united in marriage to Marjory Brunskill in the United Methodist Church in Pierre, South Dakota. To this union three children were born: Chuck, Janet, and Mark. Bernard spent his entire life farming and ranching which he dearly loved. He experienced farm life from the horse drawn era to the machinery of today. He had a love of animals and breaking saddle horses was something he really enjoyed. His word and a handshake were the only contract you needed. Bernard was a member of the United Methodist Church, a 60 year member of the Magic City Lodge A.F. & A.M., and also served several terms on the Murdo School Board. The real loves of his life were his wife, Marjory, his children, grandchildren, and great-grandchildren. Survivors include his wife, Marjory, of White River; two sons, Chuck (Marilyn) Strait and Mark (Barb) Strait both of White River; one daughter, Janet (Curt) Miller of Draper; nine grandchildren: Alyssa (Chad) St. Martin, Erica Strait, Craig Strait, Collin (Jen) Strait, Matt (Lisa) Kinsley, Carrie (Brad) Kuchenbecker, Kolby Kinsley, Shalee (Cody) Campbell, and Mandy Strait; eight great-grandchildren: Halle, Carter and Zac St. Martin, Dalton and Kendal Kinsley, Peyton and Lane Kuchenbecker, and Calli Campbell; one sister, Ardis Ahrendt of Rapid City; and a host of other relatives and friends. He was preceded in death by his parents, and one sister Arlene Anderson. Funeral Services will be held 2 p.m. CDT on Thursday, Aug. 13, 2015, at the United Methodist Church in Murdo with Pastor Rick Hazen officiating. Interment will be at the Murdo Cemetery in Murdo.